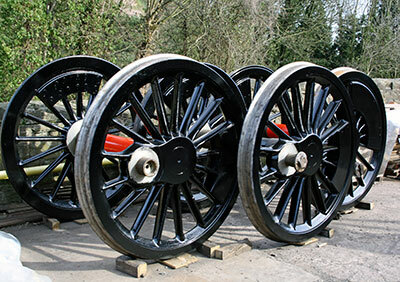 The coupled wheelsets are now fully painted by our own team and looking very smart. The axleboxes have now had the holes for the spring hangers opened out to finished size and the spring hangers have also received machinist’s attention. The optical alignment equipment has been in use in conjunction with a series of measurements being taken of the horn guides on the chassis. Construction of the steel areas of the cab floor is in progress. 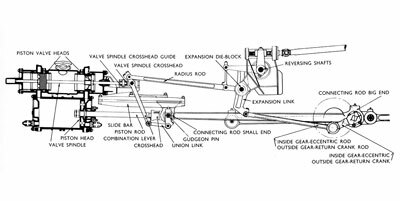 The centre cradle casting for the rear pony truck is on order, again thanks are due to the Standard 2 project at the Bluebell Railway for use of their patterns and a sample axlebox for the pony axles from our own pattern is on order. 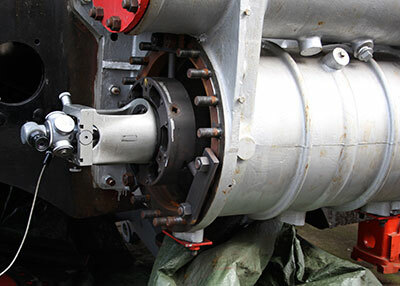 Eight spring shoe forgings are also on order for the pony trucks. If you are interested in having your own bit of 82045's motion - anonymously or not - please get in touch with Chris. Half of the remaining connecting rod weighs in at approx. £5,500, while we will also need to find a fair amount of money to have these two massive forgings machined to final dimensions ready for fitting. The con rods are fluted and look quite attractive as well as being highly conspicuous. Attention is now turning to the front end, and the next items to be announced for sponsorship will be the slide bars and crossheads. Further details from Chris. One of the most distinctive features of the front end of an 82XXX is the pair of mechanical lubricators which sit at the front of the running board fore of the steam pipes and which are protected by a hinged flap. We are about to procure these items, and wondered if anyone would be interested in laying claim to them. Castings are priced at £828 each plus VAT, while the completed lubricators come to around £16,000 for the pair. Please let Chris know if you would like to sponsor all or part of these complex and highly visible pieces of kit. This is almost upon us: 2.00 p.m. on Saturday 9th April in the upstairs Lecture Theatre at Kidderminster Railway Museum. We hope to see you there. Bryan Clarke has just informed me that the Flyer is sold out, which is great news. Let's hope that the fickle April weather plays ball on the day! Bryan and his team are looking at a completely different format for next year's special train, details of which will be announced in the autumn. I think we are all hoping that 1450 will still be available, subject to owner Mike Little's approval. 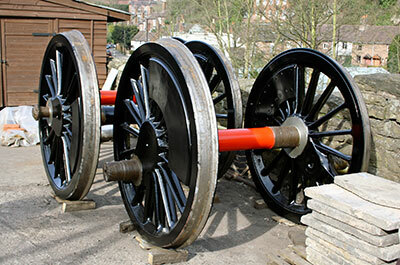 Two pictures of the fully painted wheelsets. The SVR’s optical alignment equipment in use looking through the left hand cylinder to one of the dummy axles. 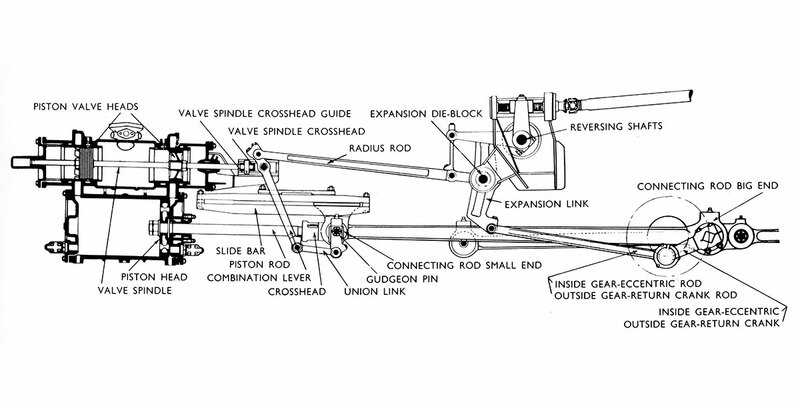 To help identify the various components of the motion here's an illustration of Walschaerts valve gear from the Handbook For Steam Locomotive Enginemen. The trailing coupling rod is only partially shown. Click the image to open a larger version.